Much like any breed, Nova Scotia Duck Tolling Retrievers face health issues. However, this club has a long history of trying to meet these issues head-on and working to eliminate the most severe problems. Jamie Klein, Chair of the Toller Health Committee, has developed the following series of articles to provide information on a variety of tests and health issues that may affect our breed. Knowing the health status of the dogs in a breeding program and others in its lineage allows breeders and genetic counselors to decide which matings are the most appropriate for reducing the incidence of disease and disorders in the offspring. This document by the Orthopedic Foundation for Animals, Inc. explains the importance of using health testing in breeding programs. By using the data submitted to public registries breeders have access to a wealth of data when determining which dogs are best for their breeding program. 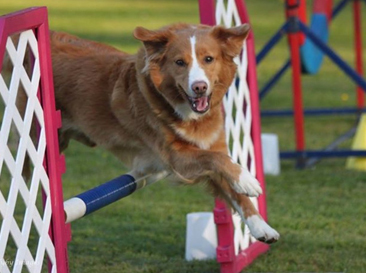 Following is a list of health tests currently required or recommended for screening Tollers in a current breeding program, including links to the various health registries and organizations as well as a detailed article on each subject. The dog has a Normal Companion Animal Eye Registry (CAER) Exam performed annually, clearing the dog of hereditary eye problems by a board certified ophthalmologist. The dog’s hips are X-rayed and evaluated by the board certified radiologists at Orthopaedic Foundation for Animals when the dog is at least 24 months of age and/or by PennHIP. OFA maintains the database. It is encouraged to make all results open to the public. Progressive Retinal Atrophy (PRA) is a genetic eye disease that affects Tollers. Recent discoveries have given Toller breeders a DNA test to help to control this affliction. Learn more about it and the steps being taken by breeders to stop this heartbreaking disease below. Unlike PRCD tests offered for other breeds, this marker test is specific for Tollers and results in a greatly reduced chance (0.05 percent or less) of false positive results. The test eliminates the guess work from a breeding program with respect to PRCD – the only form of PRA seen in Tollers which results in blindness. Breeders will no longer have to remove affected and carrier stock from their breeding programs. As long as these dogs are bred to clear dogs, they will not produce any affected dogs. To order a Toller Progressive Red Cone Degeneration (PRCD) blood test: Detailed instructions are available from OptiGen’s website that explain how to ship a sample, request a test and information about the Toller PRCD test. The dog is rated Clear or Carrier with the OptiGen PRA and CEA/CH gene marker tests unless the PARENTS are DNA tested and this offspring is deemed Cleared By Parentage (CBP). The owner agrees never to breed carrier or affected dogs that may produce Progressive Retinal Atrophy or Collie Eye Anomaly/Choroidal Hypoplasia. These results can be included on OFA’s public database through submission of this document. OFA Thyroid Panel test levels are within Normal limits as tested by IDEXX Laboratories, Michigan State University (MSU), OFA, or University of Guelph. The results of testing by these laboratories are accepted by OFA and can be included on its database. Screen annually from puberty; test females during anestrus. The dog is Certified Normal for Congenital Heart disease via an OFA Heart certification (to be performed by a Practitioner/Cardiologist/Specialist) after 12 months of age to rule out congenital defects, or Certified Normal for an Advanced Cardiac Database Exam performed by a Cardiologist annually after 12 months of age to provide clearance for adult onset heart disease. An Echo Ultrasound Heart Analysis is performed and/or Holter 24-48 monitoring of the heart’s electrical activity would be the ideal heart evaluation protocol. Degenerative Encephalopathy (DEN) unless the parents are DNA tested and this offspring is deemed Cleared By Parentage (CBP). Chondrodysdrophy (CDDY) and Hansen’s type I Intervertebral Disc Disease (IVDD) risk; new for 2017 – information available at the link. Washington State University performs this test and they have indicated that Tollers are not listed as a breed affected by the mutation because the breed has not encountered a positive result to date. a Mixed Soft-tissue Database Discounted Individual Rate of $7.50 per application when three or more soft tissue applications are submitted together on a single dog (example: Cardiac, Thyroid, Patella, and Eye applications). This discount does NOT apply to any applications requiring radiographic evaluations. This is a list of OFA approved DNA Labs. Please be aware that not every lab listed has the patent for specific DNA tests and therefore may not be OFA approved to have their results listed on OFA’s public database. However, following is a brief summary of popular labs that are currently approved to perform the DNA tests relevant to our breed at this time. This OFA form must accompany all results obtained from these facilities in order to be posted on OFA’s site. Unfortunately, liver shunts have been present too often in my line as well as with other Tollers. I have been in contact with Bannasch Laboratory to see what we can do to help genetically identify this disease. We need blood work from affected Tollers, parents of Tollers with shunts, and non-affected siblings. I would appreciate everyone’s help on this. If you have a Toller that fits one of the categories above, please contact me personally and I will speak with you about what is needed. Your help can really make the difference in working to conquer this illness! Scientists from the Bannasch Laboratory at the University of California, Davis have developed a DNA test available through the OFA to identify carriers of Juvenile Addison’s Disease (JADD) in the Nova Scotia Duck Tolling Retriever. They have also discovered the genetic cause of ONE FORM of cleft palate (CP1) in the Nova Scotia Duck Tolling Retriever. Select this link to read the letter to the NSDTR Club of Canada from the Orthopedic Foundation for Animals (OFA) announcing that they now offer DNA testing for two important diseases, Cleft palate (CP1) and Juvenile Addison’s Disease (JADD) for the Nova Scotia Duck Tolling Retriever. On February 1, 2002, OptiGen Laboratory, LLC, a canine genetic testing laboratory began accepting and processing blood tests to determine – with 99% accuracy – if your Toller is clear, a carrier of, or affected with Progressive Retinal Atrophy (PRA). This exciting new test, available world wide, is made available through the research of Dr. Gus Aguirre and colleagues of the James A. Baker Institute for Animal Health at Cornell University. “The test is as close to perfect as a test can be without actually being a true gene test,” said Dr. Aguirre, Alfred H. Caspary Professor of Ophthalmology. Technically referred to as the Toller PRDC (Progressive Rod Cone Degeneration) test, the new procedure is a gene marker test that can predict with 99 percent accuracy a Pattern A (clear), Pattern B (carrier) or Pattern C (affected) Toller. The Toller Health Coalition developed and sent out a Health Survey, the results of which are published on the companion website: Tollerhealth. Along with the Toller Health Survey, several other health concerns are discussed and explained. The NSDTR Club of Canada’s Hip/Eye/Heart Registry was in existence for over 20 years! Our early members were true pioneers with the inception of this project. Registries of any kind were few and far between and even fewer were in an open format. In the 1981 Summer Toller Talk, the first Registry list was published with seven dogs listed in the hip/eye section and six in the hip section. The importance of having proper paperwork to back up the listing was emphasized: “Barb (the Registrar at the time) stresses that dogs cannot be included in these listings unless photostat copies of certifications are received by her. Please let us keep this important file up-to-date.” The emphasis on accurate recording (backed up by copies of veterinary reports) has been maintained throughout the history of the Registry and is still paramount today. By the early 1990’s it became apparent that only listing phenotypically normal dogs wasn’t providing breeders with a full picture, so in 1995 came the addition of known PRA Carriers and PRA Affected dogs. Also during the 1990’s came the addition of listings for Failed Hips and/or Eyes other than PRA and Date of ERG and Slitlamp. By 1995 there were 322 dogs in the Registry with four PRA Affected and four Carriers entered. By 1998, now administered by Sue Kish, the Registry was flourishing. It exploded in size during Sue’s tenure as Registrar because of her determination to include all Tollers and because of Toller enthusiasts’ willingness to be open with their information. Individual owners/breeders were contacted personally and encouraged to submit copies of veterinary reports on all the Tollers that they had owned. In early 1999, there were 646 individual dogs in the database, with 55 dogs listed as PRA carriers, 35 affected with PRA and 10 with failed hips. It was during this time that it became evident that there may be a history of pulmonic stenosis in the Toller population and the Registry was expanded further by adding heart results, thus making the Hip/Eye/Heart registry that we have today! The Registry has had a host of dedicated volunteers administering it, Barb Charais got it off the ground and stayed for two years, Sheila Paul held the position for 10 years from 1983 – 1993. In 1993 Lynn Vail took over and maintained the registry for three years until 1996 when Sue Kish came on board. Cheryl Tomayer held the position from 1999 until she handed it over to Jamie Klein who is the current chair of the Health Committee. Publishing the Hip/Eye/Heart Registry online allowed for the timely release of updated information and reflected the pioneering spirit of our early members. However, times have changed and with the incredible improvements in genetic testing, there is no longer a need for the Club to maintain a list of clearances because of the public access to health clearance databases available today. Currently, all tests and health clearances can be officially documented on the dog’s OFA page and/or on K9Data. The appropriate forms from OFA must accompany the submission of all test results to OFA.